Just hours after the new poster debuted for the highly-anticipated midseason series DC's Legends of Tomorrow, The CW has released a new trailer for this superhero spinoff. 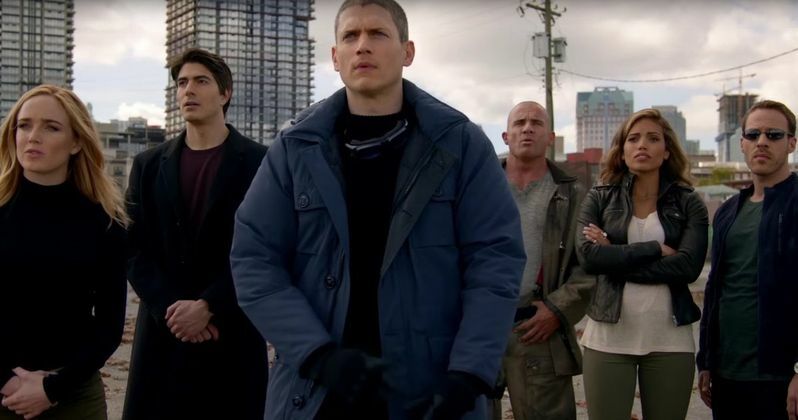 Some fans were puzzled that villains such as Captain Cold and Heat Wave were chosen for this time-travelling team, but as their leader Rip Hunter (Arthur Darvill) reveals in this trailer, these characters are "legends" in the future. This trailer also gives us a glimpse of the main villain, the immortal Vandal Savage (Casper Crump). DC's Legends of Tomorrow is slated to premiere on Thursday January 21 at 8:00 PM ET. In DC's Legends of Tomorrow, when heroes alone are not enough, the world needs legends. Having seen the future, one he will desperately try to prevent from happening, time-traveling rogue Rip Hunter is tasked with assembling a disparate group of both heroes and villains to confront an unstoppable threat - one in which not only the planet is at stake, but all of time itself. Can this ragtag team defeat an immortal threat unlike anything they have ever known? Based on the characters from DC Comics, DC's Legends of Tomorrow is from Bonanza Productions Inc. in association with Berlanti Productions and Warner Bros. Television, with executive producers Greg Berlanti, Marc Guggenheim, Andrew Kreisberg, Phil Klemmer, Chris Fedak and Sarah Schechter serve as executive producers. Glenn Winter directed the pilot episode, from a script by Greg Berlanti, Marc Guggenheim, Andrew Kreisberg. Vandal Savage (Casper Crump), who made his debut in the Arrow and The Flash crossover event earlier this week on The CW. We reported in September that Stephanie Corneliussen has signed on to play the DC Comics character Valentina Vostok, a.k.a. Negative Woman, and another report from October revealed that the show is casting for Connor Hawke. In the Arrow comic books, Connor Hawke is Oliver Queen's son, although that aspect of the comics will be discarded for the TV version. Greg Berlanti, Marc Guggenheim, Andrew Kreisberg, Phil Klemmer, Chris Fedak and Sarah Schechter serve as executive producers. Glenn Winter directed the pilot episode, from a script by Greg Berlanti, Marc Guggenheim, Andrew Kreisberg. While we wait for more details on this highly-anticipated series, check out the new trailer for DC's Legends of Tomorrow.